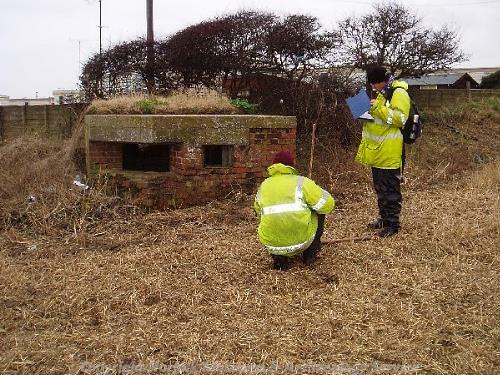 A rare World War Two heavy machine gun pillbox is located to the north of St Mary's Church (NHER 7091). Aerial photographs show that during World War Two it was surrounded by barbed wire obstructions (see NHER 38786). Pillbox. Square, of brick with concrete roof. First reported by Pillbox Survey. Accurately located by E. Rose (NAU), 14 January 1981. See record form (S1) in file by source , who adds: Very rare 1940 heavy machine gun post (type HMG/3). D. Walker (NLA) August 1996. An extant World War Two pillbox is visible on aerial photographs ((S2) to (S3)). The exact location of this pillbox is TG 38005 31255. This structure is not square, but has at least one angled corner on its northwest side. Its position in the hedgerow means that it is not visible on World War Two aerial photographs, although a curve in the surrounding barbed wire (recorded as part of NHER 38786) confirms its presence. See also other adjacent World War Two defences (NHER 38786 and 38784). December 2004. Norfolk Rapid Coastal Survey. Land based survey (see NHER 41019). Context 1. The pillbox was monitored. It is built into a field boundary bank. D. Robertson (NLA), 17 February 2006. <S2> Oblique Aerial Photograph: Edwards, D.A. (NLA). 1983. NHER TG 3731A-C (NLA 131/ASP16-18) 15-APR-1983. <S3> Vertical Aerial Photograph: Environment Agency. 2002. EA 040 AF/02C/339 6982-3 22-JUL-2002 (EA). <S4> Unpublished document: Robertson, D., Crawley, P., Barker, A., and Whitmore, S.. 2005. NAU Report No. 1045. Norfolk Rapid Coastal Zone Archaeological Survey. Assessment Report and Updated Project Design.. p 132, fig 59.